It seems strange to me that it is a felony to read somebody else’s snail mail, but the federal government seems to think it is okay to read anyone’s email. You may not be able to stop other people from reading your email, but it’s fairly easy to make it difficult. Digitally signing your email ensures the recipient that your email has not been tampered with since you sent it. It also assures the recipient that it was sent from your email account. It doesn’t technically prove you are the person who sent it, but it’s a really good first step. My employees digitally sign all of their emails. 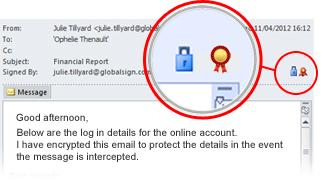 If you are using Microsoft Outlook for Windows you should see a small red ribbon icon on the right indicating the trustworthiness of the digital signature. And if you are using Microsoft Outlook for Mac you will see a little grey lock icon on the left that indicates the same thing. If you don’t see one of these icons, it probably didn’t come from us! Normally, email travels over the Internet in plain text. Anybody, including the government, can easily intercept and read it. Encrypting your email (only the body of the email is encrypted, the subject is not) can make it very difficult for it to be read by anyone who is not the intended recipient. It may not stop the government from reading your email, but I would think it, at least, slows them down. In my opinion, all business related email should be encrypted, and probably most personal email as well. In Microsoft Outlook for Windows, you’ll see a blue lock next to an encrypted email and in Microsoft Outlook for Mac, you will see a grey lock and text that says the email is encrypted. You don’t have to do anything extra to open the encrypted email in products like Microsoft Outlook; it takes care of decrypting it automatically without you even knowing (as long as you are the intended recipient). Digitally signing your email is easy and pretty cheap. My organizations spend $22.95 per user per year to get a Symantec Digital ID, but there are other places where you can obtain one. In addition to digitally signing and encrypting your email, it can also be used to digitally sign Microsoft Office documents (check to make sure the feature is supported in your version) and by PKWare to encrypt zip files. It’s easy to install and works with Microsoft Outlook and other leading email applications. You can start digitally signing all of your emails immediately. However, to encrypt an email, the person you are sending the email to must also have a Digital ID. Once they send you a digitally signed email, you will have all the information you need to start sending them encrypted emails. I encourage all of my clients to encrypt communications to us. It’s cheap, easy, and helps protect confidential information! Buying ERP Software: Local Dealer or Direct?What Should You Look for in a Fully Integrated ERP/Document Imaging System?